finally spent some time playing about with this module. Building on the white noise patch, I seem to have stumbled across Cold Mac acting as an oscillator. In fact a little like the benjolin in some aspects- which having looked at this thread makes sense if it’s half a triangle wave. You can get some very unstable sounds out of it with a very subtle setting of Maths channel 3 just past 12o’clock. Recording below - only have the ipad to record on at mo, so apologies for the quality. Awesome patch thanks for sharing. 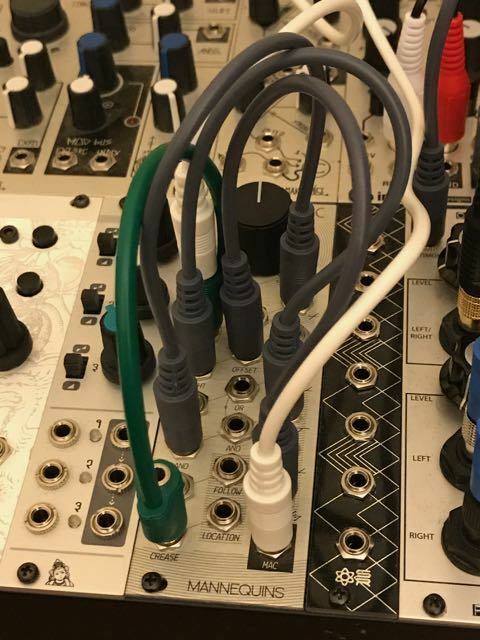 Instead of using a Triat I tried using a VCA. Then used a sequencer (Pressure Points) to open the VCA to sequence a melody. I was playing around with this patch more yesterday, and there are a number of possible variations to being able to sequence. One of the most wild was to put three sisters into the feedback loop between the Mac out and left input (instead of maths). You can then use different outputs from the three sisters to go into the left and right inputs for cold Mac. Add some self patched fm in three sisters, and you can start getting some very mad sounds. Sequencing can be done by the three sisters 1v/8 input (though I didn’t manage to try this with a sequencer per se, but used a quantised shift register output from the disting). Nice idea. I found that modulating Fade had a nice subtle wave shaping affect. Moving survey from 0 to 12 o clock will affect the nature of the fold. Alternatively you can send an external DC offset into Offset In to get greater range. Fade in alters the amplitude of the wave before the folding occurs. I get the highest pitches about 10:30 and then it bottoms out about to clicks at noon. You get a lower pitch base starting about 12:30 to full CW. With some really interesting mechanical clicks. Putting stuff into AND2 gets you some pitch/timbral changes. And there’s even more noisy goodness if you patch CREASE out > SURVEY! This is sick I can’t wait to try! Can Cold Mac be used as a simple wave rectifier? If so, how would I go about patching that up? Input goes in the Slope jack, taken from the output that looks like _ / _ (I’m sure it has a proper name). A yeah, I knew it was something simple like that! Just tossing this out here, but based on the documentation from MDoudoroff’s ‘Patching Cold Mac’ site, there’s no way to control how quickly FOLLOW responds? I was hoping to use the Cold Mac as a slew for some pitch work, but like to have it tweekable. Just wanted to confirm that there’s no way to do this with the CM. Pretty sure you’re right this I’m afraid. The other thing is that it doesn’t perfectly replicate the original voltage so it’s not good for portamento type pitch work if that’s the kind of thing you were thinking of? correct. it’s the envelope follower from the arp2600 which was fixed time response. So I tried out the VCO ideas and I came up with some wicked tones mainly squarewave based. If anyone wants to try it here’s the patch! Trying this tonight. Is CV input tracking V/oct? Not sure if it’s tracking 1v/oct properly but it does track! Here is a video of a sequenced line coming from my metropolis to the survey in of cold Mac. Sound source is only cold Mac! Sounds like a good chunk of bass in there too!